Julie Lindsey read 73 books of her goal of 50! People watching, pop culture and coffee. To ask Julie Anne Lindsey questions, please sign up. Julie Anne Lindsey Hi Janet! I'm SO glad you enjoyed Mia's story!! I have two more Geek Girl Mysteries under contract now. Books 2&3 will both arrive in 2016. A Geek…moreHi Janet! I'm SO glad you enjoyed Mia's story!! I have two more Geek Girl Mysteries under contract now. Books 2&3 will both arrive in 2016. 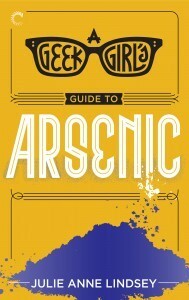 A Geek Girl's Guide to Arsenic releases in March and A Geek Girl's Guide to Justice in October. Book Him Danno Read Arsenic and I loved it from beginning to end! Writing a Review any day! Susan So wait, I've read all three books. Does that mean no more Mia, Jake, or their families? I've entered to win your book. It looks wonderful! I live in Dover, DE and I love Chincoteague. I also read, review. and blog cozy mysteries. So, very excited to see this! Are you planning more in the series? Lisa Ks Book Reviews Julie, sorry to hear it's the last of the series! I will have to look into getting the rest of the series. Hugs. Join me this month on my tour with Great Escapes Book Tours! I’m celebrating the release of book #2 in my Geek Girl Mysteries series and there will be PRIZES! We’d love your help. Let us know what’s wrong with this preview of Mischief by Amanda Quick. We’d love your help. Let us know what’s wrong with this preview of The Rancher's Baby by Maisey Yates. We’d love your help. Let us know what’s wrong with this preview of My One and Only Duke by Grace Burrowes. We’d love your help. Let us know what’s wrong with this preview of One More Moment by Samantha Chase. We’d love your help. Let us know what’s wrong with this preview of Wedding Night by Sophie Kinsella. We’d love your help. Let us know what’s wrong with this preview of Welcome to Temptation by Jennifer Crusie. Julie, thank you for the friendship. Thanks for friending me, Julie Anne! Please check out my book, "The Kingdom Hall No More"! Sara wrote: "Thanks Julie for accepting the friendship. I will be checking out your book trailer. Sara"
I LOVE meeting other readers and hearing what my next favorite book might be! So glad to meet you!! Great blog on having a career after self-publishing. I am not self-published but published by a small press. I too had my concerns if an agent/publisher would take a chance on me if I have a..."
Thanks C.S! Glad you liked the post, and it was great news to hear what really matters is that we writ our very best :) I for one love the changing culture we get to write in! Great blog on having a career after self-publishing. I am not self-published but published by a small press. I too had my concerns if an agent/publisher would take a chance on me if I have already been published but not done very well in the sales department. That is when I knew I needed to put my salesman hat on and promote and market the thing. Thanks for the blog. I now can keep my dream of being published by a larger press and having a great agent to help me create a career. Hi Everyone! *waves* So excited to make Goodreads friends! I hate missing out on must reads, so I'll be watching to see what you love!! Thank you for connecting with me. Please check out my blog Paranormal Goddess Book Blog I look forward to sharing my love of books with you. Thanks so much for the friend request! Hey Julie Anne...Thanks for accepting my friend request. Hi Julie, I'm sorry it took a bit to stop by and say thanks for being a friend. Lately it seems my day is over before it properly began. While here, I want you to know that if you ever have any questions about the books on my shelves or about eHarlequin.com, I would be delighted to answer them. Also, I list as much eHarlequin news and author news as I can so be sure to watch for my updates. Hi Julie, thanks for adding me as a friend! Thanks for the friend request, Julie. Have a great weekend.